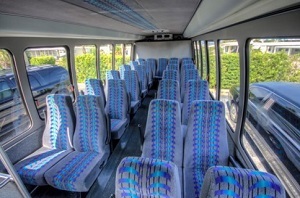 Luxury Bus From Abe’s Place to Buccaneers Training Camp. Depart Abe’s Place at 8:00 a.m. Training camp practice is 8:45 to 10:45. The Pure Limousines bus departs One Buc Place at 11:05 a.m. (or sooner if passengers are ready). Every passenger gets a certificate for $5.00 off at Abe’s Place, serving the best damn food in Clearwater. It will be good for one week, so don’t worry if you don’t have time for lunch! All for only $5.00 per person roundtrip. Buy now below! You can’t beat this deal! **Sales are final. A receipt will be emailed automatically. JoeBucsFan.com also will email you a second receipt within 36 hours. Plenty of parking at Abe’s Place! 27-seat chauffeured Pure Limousines luxury bus will leave promptly at 8 a.m. JoeBucsFan.com will check receipts/ID prior to boarding. The Pure Limousines luxury bus is not equipped with a restroom, and assistance for disabled passengers is unavailable. This is a private trip coordinated by JoeBucsFan.com. Yes, food and beverages may be consumed on the bus. Your $5.00 OFF certificate from Abe’s Place will be handed to you upon boarding. It’s good through August 13, 2016, in case you can’t use it immediately. Buccaneers practice times are subject to change, primarily due to dangerous weather. However, no changes are expected because of the early-morning start time. If practice is delayed at One Buccaneer Place, the bus will still depart Tampa for Abe’s Place at 11:15 a.m.
A fun, delicious and luxurious time is assured! THIS TRIP SOLD OUT LAST YEAR. DON’T WAIT TOO LONG!